A compact travel guide for Turku that leads you the best restaurants, shopping spots, attraction points and the accommodation options in the city. Beauty comes in many shades and you may find it in the most unexpected places. In every location, in the songs you hear, in the food you eat, there is a dash of beauty for you to find. This could not be more true for the city of Turku. Imagine walking down a sunny river boulevard, dotted by cozy restaurants within century-old buildings, contemporary music emanating from wine bars aboard old steamboats, all in the middle of a buzzing Scandinavian city. Turku has maintained an image of a university town since the 17th century; the first scholars and academics in Finland originate from the Royal Academy of Turku. It is no surprise the inhabitants are outgoing, active and young in spirit. Therefore, an impromptu debate on politics, arts or culture is not an uncommon sight anywhere. As a major harbour town to the Finnish to the Baltic Sea, Turku has historically enjoyed a priviliged position as a gateway spreading European influences to the rest of Finland. Consequently the city architecture showcases a plethora of styles and eras, and still today offers an international atmosphere to every visitor. Whenever you visit Turku, the city evolves with the season. In summer the long sunny days seem to never end. In autumn the influx of new students encourages the nightlife to new levels. In winter the city transforms into a Winter Wonderland with beautifully decorated boulevards. In spring the streets fill with promises of new life. Turku is located on the southwestern tip of Finland, on the coast of the Baltic Sea. The archipelago of Åland spots the coastline with numerous islands. The metropolitan city of Helsinki lies in the east, Tampere in the north. Turku is easily accessible from within Finland and from abroad. Several trains and buses run every hour from Helsinki and Tampere to stations at the centre of Turku. Daily ferries inbound from Stockholm and Tallinn dock at the harbour, where you can grab a bus or a train to city centre. A bus service operates every few minutes between Turku Airport and the central square, or you can always get a cab from the terminal taxi stands. Centuries ago this was the central square of Turku and the park is still surrounded by the old mansions and administrative buildings, overlooked by the medieval Turku Cathedral right across the street. Close to the harbour ferry terminals stands one of the oldest buildings in Finland, Turku Castle. It has been kept in prime condition throughout centuries, and the castle is still in active use for exhibitions and banquets. One of the few areas in Turku to survive the Great Fire of 1827, Luostarinmäki showcases Finnish handicrafts at its roots. The houses around here are still peat-roofed. Discover centuries of evolution of the Finnish art scene, with Aboa Vetus taking you to a journey to Turku’s history, Ars Nova next door leading you back to contemporary art and Turku Art Museum offering a dip into regional arts and culture. The new centre of Turku lies just a few blocks away from the Old Great Square, offering an authentic open air market every weekday from early morning until late afternoon. Adjacent to the square you’ll find Hansa Shopping Centre, containing over 150 shops and restaurants. A great variety of food products and handicrafts, closeby the Market Square. The best of Finnish cuisine can be found in the many top-notch restaurant between Turku’s market square and the Aura River. Located inside a 150 year-old building right on the river banks. From reindeer to vendace, this Viking-style restaurant offers the full diversity of Scandinavian food. Historical milieu combined with delicious cakes, sandwitches and a hot buffet, Cafe Fontana is the perfect stop-by across the tourist information office. Typical for Finland, nightlife starts around 20:00 and most bars close at 03:00. However, during summer the river boulevard and its many restaurant boats offer the best of Turku’s relaxed atmosphere. Docked at the Aura River several steamboat-turned-bars await you. Perfect for enjoying the sunny summer days before moving indoors. The Aussie Bar is famous for its international crowd and the nightclub beneath the deck. Located by the central market square, Börs and Apollo are two of the best nightclubs in town. For more laid-back nightlife, head out to Koulu (“School”) to sample their own beers, delicious food and brilliant selection of wines. A lot of young academics frequent here. The more aged dancing crowd meet at Venus, the folkiest bar in Turku. The harbour of Naantali’s old town has stunning wooden restaurants with a great view over the bay. Across it you’ll find the presidential summer palace and Moomin world closeby. Reachable by local bus. 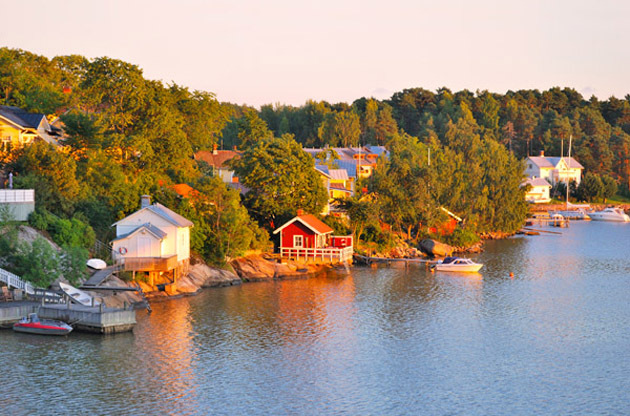 If you have a couple of days to spare, get onboard one of the Viking Line or Silja Line ferries and take a tour to Åland and the unique archipelago around it. While most inhabitants are friendly towards visitors, on weeked nights you may encounter drunken people who can be more annoying than welcoming. Swimming in Aura river is not only illegal but impractical – the river is very shallow and dirty, and the banks are not built for ease of access. Turku, a favorable city for business event tourism thanks to its offering so much to discover, the beautiful nature and growing economy. Every year, there is a remarkable number of academic and business events like conferences, congresses, trade shows, fairs, exhibitions and symposiums in the city and each of these events draw global attention.